When a Beaumont family took a trip to the Edmonton Humane Society on Sunday, they didn't expect it would end with a visit to the hospital. Brett Powlesland said his nine-year-old daughter was injured at the animal shelter on the city's north side when she was attacked by a large dog. The Humane Society is investigating the incident. Powlesland said the dog was friendly when he gave it a scratch before bringing his daughter in the room, but when it saw the child, its temperament changed. "He looked up at her, saw her face, and then it was like lightning fast. The very next thing that happened was he had her left arm right in his mouth," Powlesland told CBC News. He said he tore the dog off his daughter — possibly the wrong move, as she was cut where the canine's teeth had dug into her skin. As the pair tried to escape the room on the adoption floor of the shelter, the dog managed to take hold of the girl's other arm. "I this time put my hands in his mouth, and PRIED ITS JAW OPEN and freed my daughter's arm," Powlesland said. "And we finally got her out of the room." But she shouldn't have been in the room in the first place, he said. The Edmonton Humane Society shared the dog's records with staff at the hospital where the girl received stitches. The file contained information on the dog's immunization history, but it also had details on behavioural issues, Powlesland said. "My daughter probably should not have been let in that room. The record for the dog explained that he has issues with aggression, that he has fought other dogs," he said. Edmonton Humane Society spokesperson Jaime Caza confirmed the dog's records were given to the hospital, but did not confirm their contents. 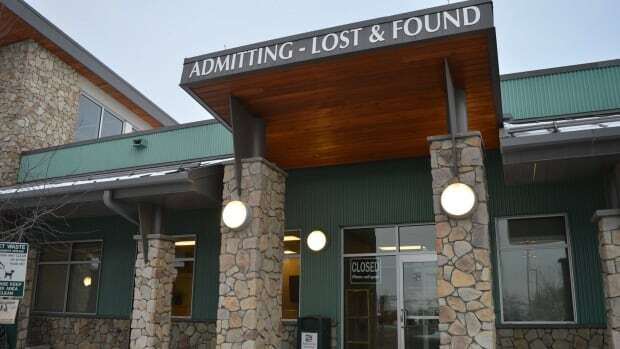 She said dogs with behavioural problems aren't permitted on the shelter's adoption floor. "They go through a screening. They go through our system with our vets as well as with our behaviour team," she said. "And in a situation like this, there would be restrictions placed on age limits that can go in there." Caza said the dog is no longer adoptable. "He is in a bite quarantine, which is required by Alberta Health Services for 10 days," she said, noting that the shelter's investigation of the incident should be concluded by then. Staff, volunteers and witnesses will be interviewed as part of the investigation, Caza said. "I'm still looking into exactly what happened to see if it aligns with what should have happened in this situation, and making sure that the right pieces are in place so something like this is avoided at all costs again," she said. Based on the results of the investigation, improved training, communications or staff supports could be implemented at the shelter. Powlesland questioned whether the training staff receive is adequate. He said they weren't unwilling to help his daughter, but didn't appear to know how to respond with first aid. "It's a good thing my wife and I are medical professionals and are trained in first aid because we were the only ones there that were doing anything," he said. "It didn't seem like they had any type of contingency plan in place for this." He posted about the experience on Facebook. Caza said she couldn't comment on how staff responded to the incident, as she's still gathering information for the investigation. Staff receive different levels of training based on their position, she said. To her knowledge, this is the first time something like this has happened at the Edmonton Humane Society, she said. "In no way does that minimize it. We're so sad and upset about this event, but it is a very isolated incident. But that being said, this is an opportunity for us to learn," she said. "We're working very closely with the family to make sure that the child is supported and providing what we can." Powlesland said he's pleased with how the Humane Society has since handled the incident. He said they offered support to help his daughter reintegrate with pets, though she was still happy to see the family's dog Paco when she got home from the hospital. "She's already given him a big hug," he said. "She's not going to be afraid of all dogs, maybe just dogs she doesn't know." As far as visiting other dogs at the shelter in the future — "that's definitely not going to be happening," he said. This sounds like a nice, friendly dog which has gone "pit". I would love to see pictures of the dog plus his biting history. However, only specific types of dogs exhibit friendly behavior and then instantly erupt into dangerous animals. I wish there was a way to determine which dogs will do this. Euthanizing every dog that might seems unreasonable to me. BSL seems like a far better solution. I think euthanizing pit bulls that have attacked is a given. Breed Specific Legislation allows current pit bulls to be grandfathered in. It's not necessarily euthanizing all pit bulls that have the capacity to launch an attack like this one, but it is eventually eliminating the breed from a given location. I'm all for Breed Specific Legislation. How many encounters with pit bulls that end with trips to the hospital have to occur before we start preventing these attacks? Normal dogs do not do not behave this way. Nutters will try and say that all dogs bite, but not all dogs attack for no reason, and continue to attack. That is a blood sport dog behavior. Mr. Powesland...with all due respect as a medical professional you owe it to your child (and any patients) to do due diligent research on what trauma staff have to say about dog bites and dog maulings...there is plenty of reports and abstracts about the usual suspect dogs...you got lucky...never trust animal shelters or even vets to give straight facts about dog breeds that attack...PS please keep your daughter's face away from the dog's face... that ounce of prevention is worth a pound of cure. I'm starting to question if Mr. Powlesland knew beforehand that the dog was dangerous. "Powlesland said the dog was friendly when he gave it a scratch before bringing his daughter in the room, but when it saw the child, its temperament changed." Why the precaution of meeting the dog first, then bringing the daughter in the room? That seems to indicate that there was some question about the dog's behavior.